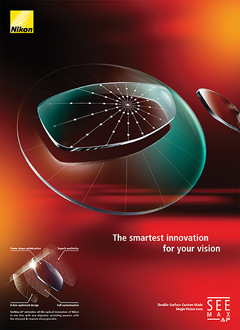 Lenses are responsible for correcting vision – they do this with a multitude of materials, designs and coatings. Ralph Carr is an independent opticians which means we are not tied to particular manufacturers and have a full range of lenses from which you can select the best option for you; this will depend on your lifestyle, preference, prescription and budget. High and ultra-high index lenses – these are thinner and lighter than normal lenses; they are often popular with patients with a high prescription who would otherwise have thicker lenses. The higher the index, the thinner the lens. Tinted lenses – these are available in most colours, which can help to improve contrast and visual clarity. Transitions lenses – these ‘intelligent lenses’ are clear indoors and darken on exposure to the sun, allowing you flexible and effective UV protection in one pair of lenses. Polarising lenses – these contain a special filter that blocks intense reflected light, thereby reducing glare. This makes them ideal for certain sports and driving. You can choose glass or resin lenses, depending on your personal preferences. Conventional hard resin lenses are lighter in weight than glass lenses and can be tinted to almost any colour. They are more easily scratched than glass but this can be overcome with the application of an optional scratch protection treatment. Hard resin lenses are also safer than glass. You won’t have to wait too long for your new eyewear, as at Ralph Carr Opticians we have our own in-house glazing facilities. Your new lenses will be glazed and prepared on the premises by our experienced technician and you’ll be able to take them home within a few days. If you would like more information about lenses, or to book your next eye health check with Ralph Carr Opticians, please don’t hesitate to get in touch. You can contact us today by calling 01744 23955..